Clostridium is a genus of Gram-positive bacteria belonging to the firmicutes. They are obligate anaerobes capable of producing endospores. Individual cells are rod-shaped, members of which are found in soil, water, and the intestinal tracts of humans and other animals. Most species grow only in the complete absence of oxygen, which gives them their name, from the Greek kloster (κλωστήρ) or spindle. Clostridium contains around 100 species that include common free-living bacteria, as well as important pathogens. We will introduce five main species responsible for disease in humans. 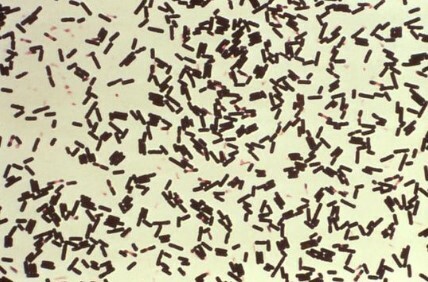 Clostridium botulinum can produce botulinum toxin in food or wounds and can cause botulism. This same toxin is known as Botox and is used in cosmetic surgery to paralyze facial muscles to reduce the signs of aging; it also has numerous other therapeutic uses. C. botulinum is a diverse group of pathogenic bacteria initially grouped together by their ability to produce botulinum toxin and now known as four distinct groups, C. botulinum groups I-IV. C. botulinum groups I-IV, as well as some strains of Clostridium butyricum and Clostridium baratii, are the bacteria responsible for producing botulinum toxin. C. botulinum is responsible for foodborne botulism (ingestion of preformed toxin), infant botulism (intestinal infection with toxin-forming C. botulinum), and wound botulism (infection of a wound with C. botulinum). C. botulinum produces heat-resistant endospores that are commonly found in soil and are able to survive under adverse conditions. Honey sometimes contains spores of C. botulinum, which may cause infant botulism in humans one year old and younger. The toxin eventually paralyzes the infant’s breathing muscles. Adults and older children can eat honey safely, because Clostridium species do not compete well with the other rapidly growing bacteria present in the gastrointestinal tract. Clostridium difficile can flourish when other gut flora bacteria are killed during antibiotic therapy, leading to superinfection and potentially fatal pseudomembranous colitis (a severe necrotizing disease of the large intestine). Under the microscope, they appear as long, irregular (often drumstick- or spindle-shaped) cells with a bulge at their terminal ends (forms subterminal spores). Under Gram staining, C. difficile cells are Gram-positive and show optimum growth on blood agar at human body temperatures in the absence of oxygen. C. difficile is catalase and superoxide dismutase negative, and produces two types of toxins: enterotoxin A and cytotoxin B, which disrupts cytoskeleton signal transductions in the host. When stressed, the bacteria produce spores that are able to tolerate extreme conditions that the active bacteria cannot tolerate. Clostridium perfringens causes a wide range of symptoms, from food poisoning to cellulitis, fasciitis, and gas gangrene. Clostridium perfringens is found in many environmental sources as well as in the intestines of humans and animals. C. perfringens is commonly found on raw meat and poultry. It prefers to grow in conditions with very little or no oxygen, and under ideal conditions can multiply very rapidly. Some strains of C. perfringens produce a toxin in the intestine that causes illness. C.tetani is found as spores in soil or in the gastrointestinal tract of animals. C. tetani produces a potent biological toxin, tetanospasmin, and is the causative agent of tetanus, a disease characterized by painful muscular spasms that can lead to respiratory failure and, in up to 10% of cases, death. The spores are distributed widely in manure-treated soils and can also be found on human skin. The incubation period is typically 3–21 days. The period of illness is 14 days. C. tetani is not contagious. Clostridium sordellii is a rare bacterium that causes pneumonia, endocarditis, arthritis, peritonitis, and myonecrosis. C. sordellii bacteremia and sepsis occur rarely. Most cases of sepsis from C. sordellii occur in patients with underlying conditions. Severe toxic shock syndrome among previously healthy persons has been described in a small number of C. sordellii cases, most often associated with gynecologic infections in women and infection of the umbilical stump in newborns. Enzyme immunoassay. The enzyme immunoassay (EIA) test is faster than other tests but isn’t sensitive enough to detect many infections and has a higher rate of falsely normal tests. Polymerase chain reaction (PCR). This sensitive molecular test can rapidly detect the C. difficile toxin B gene in a stool sample and is highly accurate. GDH/EIA. Some hospitals use a glutamate dehydrogenase (GDH) in conjuction with an EIA test. GDH is a very sensitive assay and can accurately rule out the presence of C. difficile in stool samples. Cell cytotoxicity assay. A cytotoxicity test looks for the effects of the C. difficile toxin on human cells grown in a culture. This type of test is sensitive, but it is less widely available, more cumbersome to do and requires 24 to 48 hours for test results. Some hospitals use both the EIA test and cell cytotoxicity assay to ensure accurate results. Meites E, Zane S, Gould C. “Fatal Clostridium sordellii infections after medical abortions”. New England Journal of Medicine. 363 (14): 1382–3.